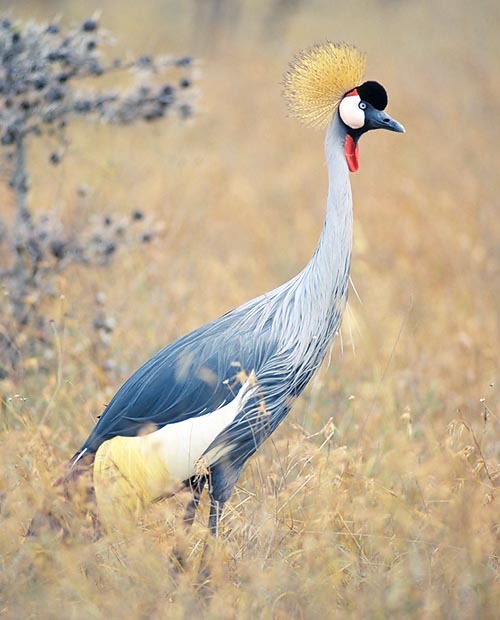 The Grey crowned crane or Crane of South Africa (Balearica regulorum Bennet, 1834) is a bird belonging to the subclass of the Ornithurans (Ornithura), superorder Neognaths (Neognathae), order Gruiforms (Gruiformes), family (Gruidae). The gruiforms form an order with an almost cosmopolitan distribution, as they are found everywhere, but the poles and South America. The members of the various species forming this composite order, among which stand the classical Eurasian crane (Grus grus), do have general morphological lines falling in a structure characterized by a long and thin neck, very long legs like a wader, and a sharp and straight beak. This often leads the uninitiated people to consider these birds as relatives to the herons and the storks. But the resemblance is only external; on a closer and more thorough investigation, the members of the Gruidae, prove to be much closer to the coots, the common moorhens and the bustards, with which and with other groups, they form the order of the Gruiformes, in any case not too far away, systematically speaking, from that of the Galliforms (Galliformes). 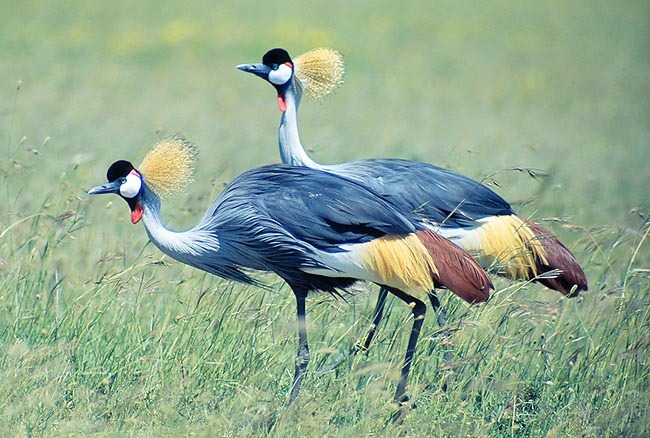 Hence, the morphological convergence of the cranes towards the type of the herons and the storks may be explained in the terms of an “eco-evolutionary” convergence, that is, due to an adaptation to similar environmental conditions and biotopes: ponds, lagoons, marshes, wetlands, waterways and rivers. Actually, as already briefly said, many are the anatomical differences between cranes, storks and herons: one stands in the structure of the beak which, even if very long also in the cranes, does not reach the enormous size it has in the other two groups; furthermore, it is not equally robust, on the contrary, at the base it is very soft, seen that the diet of the gruiforms is mainly vegetarian, and consequently the beak is not utilized for sticking animals such as fish, frogs, salamanders, lizards and other vertebrates, at least in the normal cases, as exceptions are always possible in zoology. 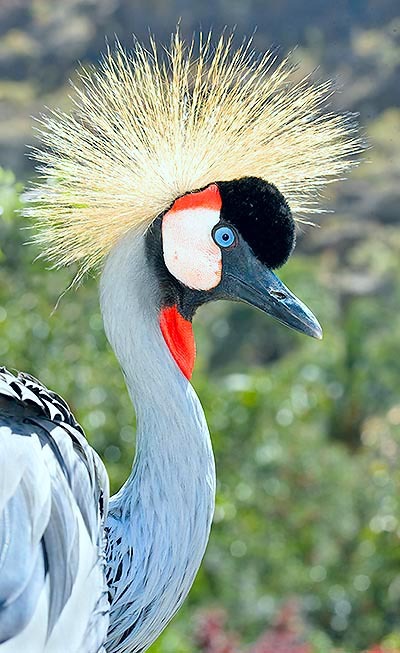 In this text we shall treat of the Balearica regulorum, which has in the Black crowned crane (Balearica pavonina) a much similar species, but differing for the type and the distribution of the colours in the livery; elements which are considered sufficient for classifying them as two different species. Also the sizes are very similar, and both do live nowadays in the same biotopes of tropical Africa, and have a geographic centre of common origin: the archipelago of the Balearic Islands, in western Mediterranean, where, by now, are extinct. The scientific names of Balearica regulorum and Balearica pavonina come from this common geographic centre, and some ornithological biologists talk about a nominal species and of one subspecies. The debate among taxonomists is still on the way. Tropical Africa. They are birds which may appear in pairs, as well as in numerous crowds, and although belonging to a vulnerable species, after the IUCN, do have a vast geographic range. Nowadays, we find them in fact in South Africa, Tanzania, Kenya, Mozambique, Uganda, Angola, Zimbabwe, Malawi, Namibia, Burundi, Congo, Botswana and Ruanda. These birds may form also small colonies of a fifty and more, of con-specific and con-generic individuals, or live associated with other types of birds, such as flamingos and spoonbills. Their preferred habitat, as for all the gruiforms, stands in the wet areas, and for this reason we find them close to reed bed wetlands, lakes, ponds, pools, swamps, lagoons, mangroves, flooded meadows, rivers, water streams and creeks. Unluckily, the environments frequented by these birds are increasingly deteriorated by the careless intervention of the man, and for this reason, nowadays, their life is not easy at all. They are birds of respectable size. More or less one metre long, they have a wingspan of about two metres, and males as well as females weigh usually 3,5-4 kg. During the flight, particularly during the social migratory one, they may get a V or inverted Y formation, where the led is assured by an adult dominant male, which, at times, remains a little further behind, while trying to cut through the air. When a large raptor is in sight, or the wind blows too much, the flock may assume a semi-circular disposition in order to deal with the plight. They are able to fly up to 5.000 m of altitude! They may be easily distinguished from the flying herons, as these last ones bend the neck towards the shoulders, whilst the grey crowned crane and the other species keep it right. Unlike herons and storks, these birds are not dumb, but emit a trumpet-like sound (this applies also for the other species), which propagates over long distances, showing their presence. The strangest character of the Balearica regulorum, as well as the Balearica pavonina, stands in the crown of feathers which surmounts the head of both sexes: a crest formed by golden-yellow feathers. The prevailing colour of the body (primary and secondary coverts, remiges) and of the beak, is a bright metallic grey tending to the sugar paper (conversely, it’s dark grey and black in the Balearica pavonina). Along the sides, there are two large white diverging dots. The tail in the flight feathers has a golden shade, with earthy brown apex. Two nares are visible on the beak on the upper branch, shaped like a drop. The head, in addition to the aforementioned crest on the occipital lobe, has a velvety black dot covering the head, followed by two thin red stripes in parietal position; the face has two white cheeks, a pair of red wattles on the neck. The legs are long and the foot is anisodactylous, the fingers end in a long and robust nail. Unlike the other species of cranes, the South African grey crane roosts also on the trees during the night, in fact this is a regular occurrence. Always in relation to their alimentary ecology based on seeds, tubers, tender shoots, to which however may be added earthworms, insects and other small invertebrates, such as mole crickets, crickets, grasshoppers and locusts. Their bowel, like that of the other Gruidae, is very long, almost nine times longer than the trunk, however, unlike gallinaceans, a real goiter does not exist. In relation with the diet, they have an unpalatable flesh, but unfortunately this has not been, for a long time, a sufficient deterrent for avoiding their “sport hunting”, a practice which is now strictly forbidden by the IUCN, CITES, WWF, in collaboration with the governmental organizations. Also the temper of these birds (and, generally, of all the Gruiformes), is well different from that of the storks and the herons, which are often wranglers and greedy marauders always ready to contend for the best bits: the cranes are mild, pleasant and, furthermore, do have a resonant voice, rich in vocal expressions. All the gruiforms, in the wild, are wary birds, particularly towards the human being. On the contrary, they adapt quite well to the life in captivity (and for this reason they are often met in the zoological gardens), and get very fond of those caring them. When ageing, however, they become quarrelsome and intractable, and they become even dangerous for the shots they beat with their sharp beak, not only for the man, but also for the dogs and possible barnyard animals. Their average lifespan is of 22-24 years. The ornithological biologist Homeyer, studied in Congo, during the thirties, the Balearica regulorum for about 20 years. For what the reproductive ethology is concerned, he remarked that the male as well as the female, are involved in building the nest in wetlands, on bushes or on the soil, in the thicket. The nest is realized utilizing mud, branches, twigs and saliva. Biologist Homeyer tells, on a report to the English Ornithological Society, in relation with the reproductive ethology of these birds what follows: “… The female, which thought not to be seen, began its nuptial livery, taking some slush and rubbing the wings and the back with it, thus to lose the whole colour of its livery, for getting a more earthy colour; having unluckily killed the animal in order to examine it more closely, I realized that the bird had created a dough with the saliva, which badly washed and had a pungent, acid, taste … in only one swoop I got the factual explanation that the male attention was attracted not only by means of visual stimuli, but also gustatory…” Homeyer, 1930. Usually, the female lays 2-3 eggs (rarely 4), of a pale blue colour, which are incubated and controlled alternately by the parents. The eggs open after 28-32 days. The chicks have a rather quick development. A few days after the birth, are already capable to get out from the nest, but they are nourished till when 50-60 days old. The ornithological biologists have identified two subspecies of Balearica regulorum, which are the Balearica regulorum regulorum, autochthonous of South Africa and Angola, and the Balearica regulorum gibbericeps, autochthonous of South Africa, Zimbabwe, Congo, Kenya and Uganda. In this last nation, it is found also in the coat of arms, as it is considered as “national bird”.